The numerous advantages and disadvantages of time zone differences can be a topic of never-ending discussions. In this article, I will describe my experience in managing a time zone difference while working with clients from the United States, Ireland and Australia. 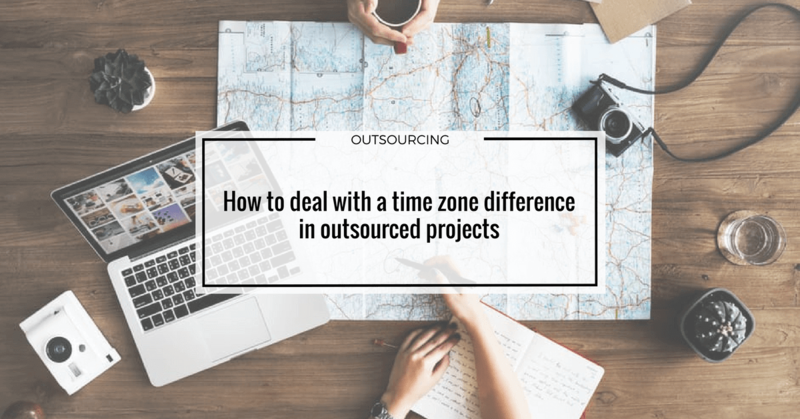 When considering time zones and ways of dealing with them, it is worth to distinguish two types of projects: when the client’s team is from a different, but the same for all members, time zone or when the client’s team works in different time zones and we are in yet another time zone. I have been working with clients from various parts of the world for about a year. The biggest time difference between our company (based in Poland) and the customer is 10 hours (the Client is from Australia). So far, working with them is the biggest challenge for me. I have to pay attention to how the time changes in Australia and to compare it with our daylight saving time etc. There is now a 10-hour difference in time between us. Clients from Ireland are just an hour apart but when we want to arrange a meeting at the end of the working day, sometimes even this hour is a challenge. The team of our client from the USA live in different time zones. So we have to adjust the date of meetings to three different zones. For several months, we have been working out some tricks that help us properly plan that kind of cooperation – working in different time zones. One of the problems is when the team needs some kind of requirement clarification, many emails may go back and forth and work is stuck until the requirements are well-clarified and understandable for everyone. When you work in different time zones, it is hard to communicate anytime you want. If we need information, we have a so-called blocker in the project, and often face a dilemma: we can assume what the client wants, prepare it and then consult or wait until the client wakes up. So rework might happen if the team misunderstood the expectations of the clients or we have some downtime if we are waiting. The delay caused by the need of rework increase the project cost and thus reduce the Client satisfaction. Setting appointments can also be a big challenge if we work in different time zones. In our company, working hours are quite flexible but despite that, if there is 10 hours difference between us and the customer, it’s hard to organize a call during normal business hours. So we had to do a demo for an Australian customer at 10 PM our time (luckily, the customer didn’t mind me wearing full make-up as I was ready to go out for a party). The problem of arranging a demo, planning a meeting or retrospective becomes even bigger when the client’s team is in different time zones. Then we have to find an hour that suits everyone. We had a client whose team was in two different time zones and ours was the third. Meetings had to be planned well in advance and we used an application to choose the right time. Our projects follow the agile model. We overcome the time zone obstacle by using processes and technologies to empower people to engage, connect and collaborate. It is also important to give the team a common working space to share, find, and collaborate on the information they need to get the work done. We use cloud tools like Google Drive to share and collaboratively edit important documents, projects, and other files without having to send multiple versions back and forth. Google Documents, in particular, is a crucial app in this exchange, as its commenting feature allows multiple editors to debate and brainstorm right in the document in a seamless conversation that doesn’t grind to a halt when one team member clocks out of a day that’s just beginning for someone else. I do not want to waste my energy trying to calculate time zone differences, so usually, I use some tools or applications. Also, I have to plan my calendar and daily schedule accordingly. I have to remember each country’s daylight savings period and public holidays – or I’ll be left wondering why no one is available on Slack. People can also get busy and sometimes forget that we’re in a different time zone and not available now. It just happens, so I try to keep communication open and transparent. I always share availability, movements, holiday time, plus regular updates via e-mail or Slack. Over-sharing might even be okay in that kind of situation! Slack is my best friend. I’d be lost without Slack – it provides an excellent hub for conversations and a record of previous discussions by team members for when we are away or sleeping. In projects with clients from a different time zone, it is very important to establish communication rules. Any communication should be done through previously established channels. We appreciate daily communication and constant contact with the client. That is why we use a well-known tool – Slack. There is an option – sleep mode, which allows you to not disturb the client during his night. We also send daily updates to our clients. Thanks to that, despite the difference in time, the client knows what we’re doing. When working with clients in very different time zones, I have to make some compromises with my schedule. Using Google Calendar is handy because it allows me to schedule meetings and appointments in both my client’s time zone and mine, without either having to decipher it together. As I have mentioned before, I have clients in Australia, and I’ve grown used to the fact that our developers sometimes work for a few hours on a Sunday night to meet the client’s requirements for Monday morning. I also try to set boundaries for myself and my team. I have the best developers on my team and I love working with them but they’re not machines and they simply can’t work 24 hours per day, so setting boundaries is seriously important for their health and productivity levels. The odd late night to meet a deadline for a client on the other side of the world is okay, but I often feel remorse that programmers work in the evenings. Working with clients from multiple time zones doesn’t have to be a problem. I just needed to get familiar with it and start to live and breathe those zones. What I can advise is that sometimes you need to put up several clocks on the wall if that’s necessary. We have a whiteboard with all our projects and we mark the number of hours that separates us and the customer there. Overall, it is an interesting adventure to deal with clients in multiple time zones, with contrasting seasons and different holidays. It definitely keeps your day interesting and it beats the boring 8-to-4 office job. Graduate of Gdansk University of Technology. Recently started a career in Project Management. Enthusiast of Agile and Hybrid Methodologies.